Battle of Issus (333 B.C.) - Alexander the Great conquered the Persian Empire in essentially three battles: Granicus in 334 B.C., Issus in 333 B.C. and Arbela in 331. Issus was the first meeting between Alexander and King Darius III of Persia. 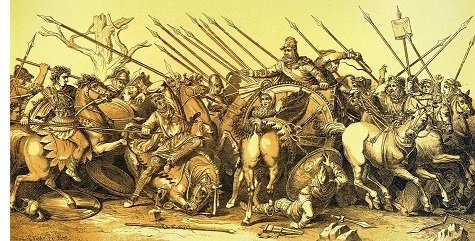 Despite having an army twice the size of Alexander's, Darius could not defeat the master tactician and fled the battlefield (he was ultimately defeated at Arbela). The Battle of Issus opened up the east coast of the Mediterranean to Alexander and he worked his way south conquering everything as he went.